Anyone with aging parents knows that it’s nearly impossible to get them to admit to needing help. Ask them how they’re getting along, and they’ll constantly reply, “We’re fine.” But before the day arrives when a fall or accident happens that indicates all is not well, family members and caregivers need to address the challenges that can arise when seniors want to stay living independently in their homes. 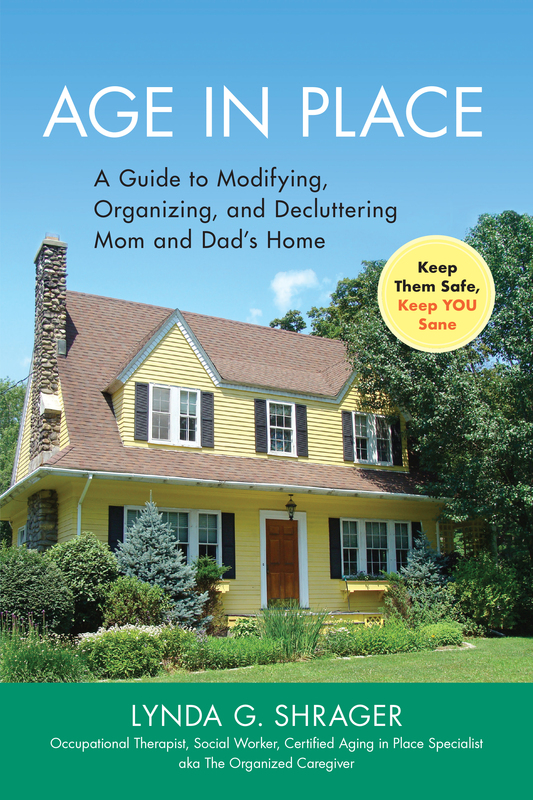 In her new book, Age In Place – A Guide to Modifying, Organizing, and Decluttering Mom and Dad’s Home, author Lynda Shrager, an occupational therapist and Certified Aging in Place Specialist, has provided a handbook for safeguarding Mom and Dad’s home, all while keeping family relationships intact. Parents may feel their opinions aren’t given any consideration if family members swoop in and start callously making changes to their home and routines. The best chance for success, she says, is to work cooperatively, not lose your patience and always treat Mom and Dad with the respect they deserve. This means that you first need to do your homework, which entails spending time with your parents in their home as they go about their day-to-day lives. See how well they’re able to negotiate the stairs, whether they encounter obstacles when picking up the mail and the newspaper, whether they can reach kitchen items easily and if any frayed rugs or pets pose a tripping hazard. Age In Place provides a guided walking tour that goes room by room, as well as around the exterior of the house, to assess potential dangers. It suggests how to make modifications to maximize safety and make for easier navigation, such as adding railings, ramps or stairlifts to manage stairways, and adding furniture glides or chair risers for help with getting in and out of chairs. Clutter is both a safety hazard and an anxiety inducer. Shrager points out that the feeling of knowing they need to get the clutter under control, but not knowing where to begin, causes a constant feeling of stress. She recommends that you role-play as you walk from room to room with your parents that you are guests for the first time in the home. This makes it easier to notice where papers have piled up or knick-knacks have over-filled the shelves. Shrager recommends breaking the chore of de-cluttering into bite-size pieces, taking on cabinet or one closet at a time. Her acronym “OHIO,” Only Handle It Once, and of putting each item into one of five piles — keep, give away, sell, donate or throw away — helps expedite the process. Beyond organizing and making structural modifications around the home, Shrager also provides advice for how to detect any declines in parents’ cognitive abilities. If they seem to be overwhelmed with managing the bills, the pills or the household maintenance, they’re in need of more help. She offers suggestions for resources to investigate, how to organize schedules and what divisions of responsibilities make most sense. In all, Age In Place takes the uncertainty out of managing the needs of aging parents by helping family members recognize potential problems and heading them off before they occur.